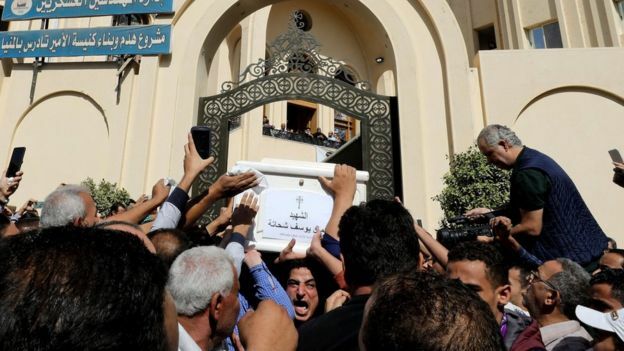 The Islamic State (IS) group earlier said it was behind the attack, the latest in a series by extremists on Egypt's Coptic Christian minority. 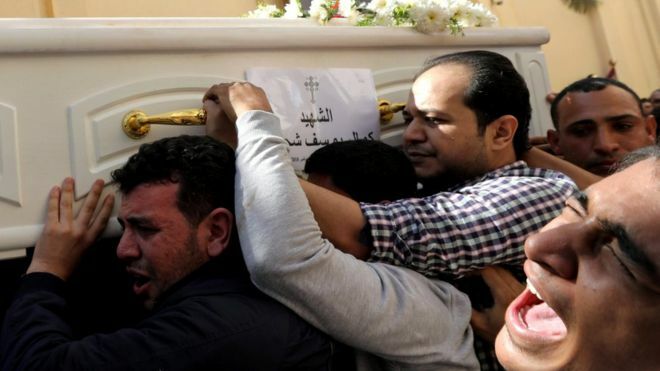 Egypt's Copts, who make up most of the Muslim-majority country's Christian minority, have in the past accused the authorities of making only token gestures to protect them from such attacks - including one at the same spot which left 28 dead in May 2017. Friday's attack on two buses near the Monastery of St Samuel the Confessor in Minya also left at least seven others wounded - including children, according to reports. 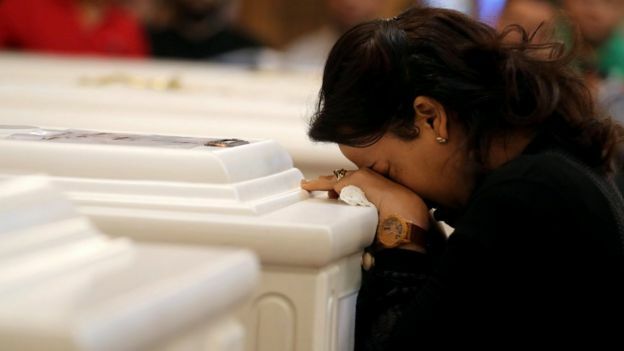 On Saturday, people displayed their anger and frustration: according to news agency AFP, the coffins were carried away from the church accompanied by cries of "with our souls, with our blood, we will defend the cross! ", while security members - sent to guard the congregation - were booed. "Should I carry a gun with me when I go to pray or when I'm at home? Because I could die if I go to church," he asked. Others, however, struck a more conciliatory tone. "We would like to tell them [the attackers] that we still love them despite what happened. We have a question though - why are you doing this to us? We do not commit malice towards anyone," Rad Noseer Mitri, priest of Mar Girgis Church, told mourners, according to news agency Reuters. "We serve our church and nation in complete honesty. We play no role in terrorism or hate. We only play a role in serving our church and country like any other people all around the world." 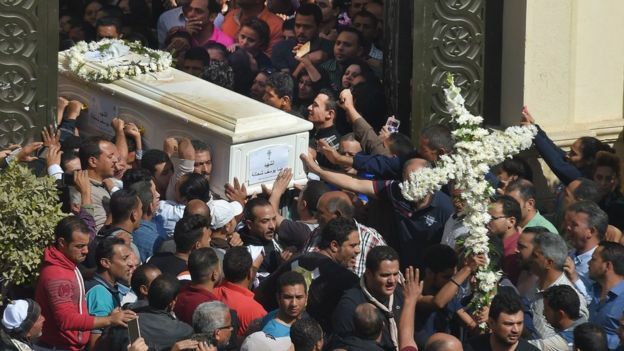 Bishop Makarios of Minya - who thanked security staff - promised the congregation they would "not forget the promises of officials, including the president of the republic, that the criminals will be punished". 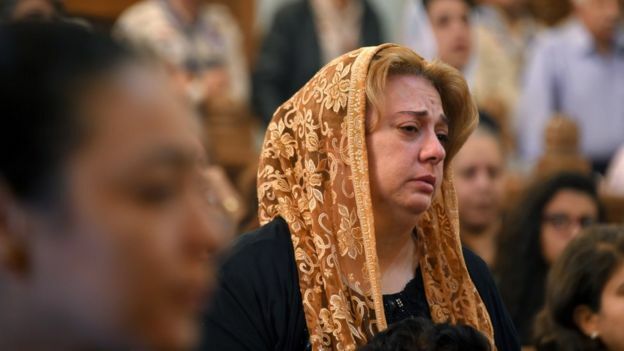 "There is a mix of sadness and pain; sadness as these painful events are being repeated and pain because Copts are part of this homeland and part of its fabric," Bishop Makarios added. President Abdel Fattah al-Sisi held a minute's silence for the victims, and called Coptic Pope Tawadros II to offer his condolences. The current Coptic Pope, Tawadros II, observed his own social media ban last month by closing his official Facebook page.